Menopause is a physiological period of a woman’s life characterised by several hormonal changes that lead to the disappearance of the menstrual cycle. Not by chance in the past, to indicate this stage of life, they used the word climacteric, which, from the Greek klimaktḗr -êros, means step, stage, difficult point. Indeed, the changes taking place in this period make many women wonder how to deal with menopause in the right way, to limit the discomfort and protect health. The real menopause coincides with the end of ovarian activity and, therefore, the end of menstruation. This stage typically occurs between 45 and 55 years of age (the average age in Italy is around 50 years). Instead, early menopause refers to cases where onset occurs before age 40 (the causes may be different: from autoimmune diseases, to ovarian failure, up to drug and radiation therapies). The hormonal changes that characterise this stage of the female life bring along many changes affecting both the physical and the emotional and social sphere. Menopause, indeed, causes a number of symptoms to the body, since it is progressively depleted in the production of hormones; oestrogens and progesterone influence, indeed, the whole body and numerous vital processes (heart, skin, nervous system, bones, metabolism etc.). changes in the skin (skin dryness or irritability etc.). It should be added that, failed the "protective" action of oestrogens, the female body is also more exposed to problems such as disorders of the genitourinary system and urinary tract (cystitis, etc.) and osteoporosis. Moreover, there are also a number of psychological problems related to hormonal changes such as insomnia, nervousness, depression, irritability. Menopause, as we have seen, can bring along various ailments. However, menopause is not a disease and should, actually could, be addressed in a calm and aware attitude. If in doubt, or at the first signs, you should always consult with your trusted gynaecologist, also to get ready for this time of change. Those who wonder a little anxiously how to cope with menopause, should remember that sometimes you only need to follow a few simple rules to live with greater confidence. So let's see some helpful tips for living menopause at best. The watchword for the women who wonder how to deal with menopause is "prevention". In fact, this is very important in every period of life, but becomes critical in menopause. It is therefore necessary to undergo regular gynaecological exams and follow appropriate prevention programmes; it is also important to undergo specific tests that can detect pre-cancerous lesions or polyps (pap test, faecal occult blood test, pelvic and transvaginal ultrasound etc.). To assess whether you are at risk of osteoporosis, you can also request a special examination, the CBM (Computerised Bone Mineralometry), which reports any bone degeneration. In menopause it is critical to control body weight. A slight increase in weight caused by the slowing down of metabolism is normal; it is therefore good to check and slightly reduce daily caloric intake, favouring light foods especially in the evening. An extra suggestion is to "keep an eye on" your waistline: monitoring the increase in the circumference of the waist and hip is indeed also a form of prevention. Fat around the waist represents a risk factor for cardiovascular disease and diabetes. To address menopause and its symptoms naturally you can also make use of phytoestrogens. Notwithstanding that, if in doubt, it is always good to also hear the opinion of your gynaecologist, there are many studies that confirm the benefits of these substances. For example, several researches have shown that phytoestrogens in soy improve the typical symptoms associated with menopause (e.g. they lessen hot flushes, to an extent significantly superior to placebo, and reduce the typical vaginal dryness of menopause [...]). " (F. Firenzuoli, Le 100 erbe della salute, Milano, Tecniche Nuove 2000). To take advantage of the action of these substances, you can also use some specific supplements, made from plant extracts such as black cohosh, soy, red clover and sage. The beneficial effects of phytoestrogens in counteracting some of the typical menopause symptoms is confirmed by various studies. For example, a research reported in the Corriere della Sera (a major Italian newspaper) found that "Oriental women" almost "do not know the climacteric syndrome that bothers 60% to 80% of the Western women when menstrual periods stop." This positive aspect may be connected to an abundant consumption of foods such as rice and soybeans, which contain substances with a similar effect to that of oestrogens. You should try to minimise "bad habits", such as smoking and alcohol consumption. In this period women should indeed rethink their health in a preventive perspective. Of course, you can drink a glass of wine with meals, but you should eliminate smoking and alcohol consumption. Increased energy intake with alcohol use can certainly promote weight gain and finally put strain on your liver. Physical activity can be of great benefit in every period of life, more so in menopause. Regular physical activity, indeed, will help speed up metabolism and fight accumulated stress. It is known that in this period of life, women tend to put on extra pounds, also due to a reduced ability of the body to burn calories. Some studies have also shown that a mild physical activity can play an important preventive role; brisk walking for about an hour a week would reduce, for example, the risk of fractures and osteoporosis. An article about how to deal with menopause, could not overlook sexuality. This aspect may indeed be influenced by hormonal changes, typical of this period. Oestrogen deficiency can result, for example, in a loss of libido and promote vaginal dryness. Psychological issues can also arise, which prevents women from having a serene approach to sexuality. In these cases, it is advisable to address the subject with your gynaecologist, calmly, to identify the best countermeasures. Following this advice, you can also consider the use of lubricants (even natural, such as calendula-based ones), or supplementation with products made from plants rich in phytoestrogens. 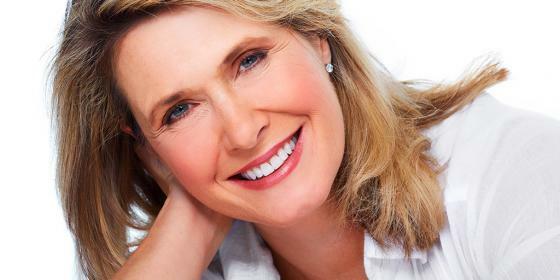 The hormonal changes of menopause can also affect negatively skin and hair. That's why many women who wonder how to deal with menopause are often seeking advice also useful for the beauty and care of skin and hair. A sudden drop in oestrogens that occurs during this time has concrete consequences on the health and beauty of the skin. The skin becomes generally more dry and thin, it tends to lose elasticity and redness may occur due to an increase in sensitivity. That's why the answer to the question "how to deal with menopause?" should also examine issues relating to health and beauty of skin and hair. If food alone is not enough, you can also help your skin "from inside" possibly taking supplements based on hyaluronic acid and collagen enriched with antioxidant vitamins. Faced with a copious hair thinning, the first thing to do is, therefore, talk to your gynaecologist or trusted doctor to identify the exact causes. use specific supplements made from extracts of bamboo, millet and horsetail, plants useful in supporting the natural health of your hair.